The Pro-Tech Service Award recognizes those Konica Minolta dealerships that demonstrate the highest commitment to customer support and satisfaction. This is the 16th straight year Tronitech has been honored with this prestigious award. “The Pro-Tech Service Award is a mark of distinction that we are proud to showcase. It symbolizes our commitment to offering the best business practices and the best in service. It certifies to our customer base that we have the skills, people and systems to keep their Konica Minolta equipment operating at the highest level of productivity. It shows to our customer that they can depend on us,” – Randall Wheeler of Tronitech. Digital technology makes microfilm data more powerful than ever. The UScan UF-Series embodies economy of scale with its ability to read, scan, print, email and save images from roll microfilm, microfiche, opaque microcards, aperture cards and photographic materials , the UF-Series design and multiple-use functions create an ideal unit for public access, walk-up patron and light preservation use. Scans in color, grayscale and bi-tonal. High-resolution viewing, with auto imaging and optional trimming and masking. Dual scan and print output at a single touch. The ability to read on screen, print on paper, scan-to-PC. All at a cost you can afford. High-resolution scanning: optical resolution of 600 dpi and selectable scanning density of 200, 300, 400, 600, and 800 gives you superior image quality for using microfilm information in websites, Email distribution and desktop publishing applications. Versatile interface: standard USB 2.0 or SCSI-2 connector and high-speed video connector for direct printing. 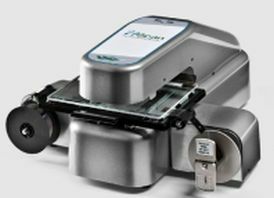 A total solution for microform access and distribution. With 12” x 17” widescreen viewing, to display more visual information. 600 dpi optical resolution. Laser or wide format printer options. And versatile interface – USB 2.0 for PC plus video for direct print. The MS7000 MKII gives you widescreen, high-resolution 12” x 17” viewing to display more visual information. It lets you quickly access the data, drawings, graphics and microfilm archive information you need. You can electronically enhance images, zoom in on areas to magnify fine details, and utilize a wide range of auto imaging convenience features. Then scan to PC for electronic distribution as Email attachments, on websites, or for use in desktop publishing. Print on a high-quality Konica Minolta Laser Printer, at full 20 ppm. Or use optional KIP Starprint 2000-Series Printers to output wide-format engineering and technical drawings. The intelligent desktop microfilm camera for today’s microfilming needs. Fast, simple, and versatile. Automatic aperture size selection (single frame or double frame), frame indexing, and single corner positioning maximize productivity, image quality, and ease of use. Automatic Focus and Reduction No need for manual adjustments. DR1600 automatically determines document size, focuses, and sets reduction ratio. Full Upright Images Every Time Automatically senses document width and selects correct aperture size. Records up to legal size (8.5″ x 14″) in single frames; larger sizes in double-width frames. All recorded images are upright for easy viewing.